I currently live in Florida. Growing up on Long Island made me think *that* was a crazy place. One Sunday the New York Times ran a cover of its magazine with an image of Long Island and all the crazy crime it had like the time a guy kidnapped a girl and held her captive in a cage he built under his front lawn or Amy Fisher or just a bunch of craziness. I had been to Florida but had not thought much about its craziness beyond the hanging chad controversy of the 2000 presidential election. Wow, did I miss the boat or what? First there’s the obvious fact that if you shoot someone in Florida, you damn well better kill them AND it helps a whole lot if you are white or look white. If you know anything about Marissa Alexander, you know what i am talking about. She fired off several warning shots to scare off her abusive ex-husband and now faces up to 60 years in jail. I can think of at least two cases where young, black men or boys were killed by white to white looking people and they didn’t even get a slap on the wrist. 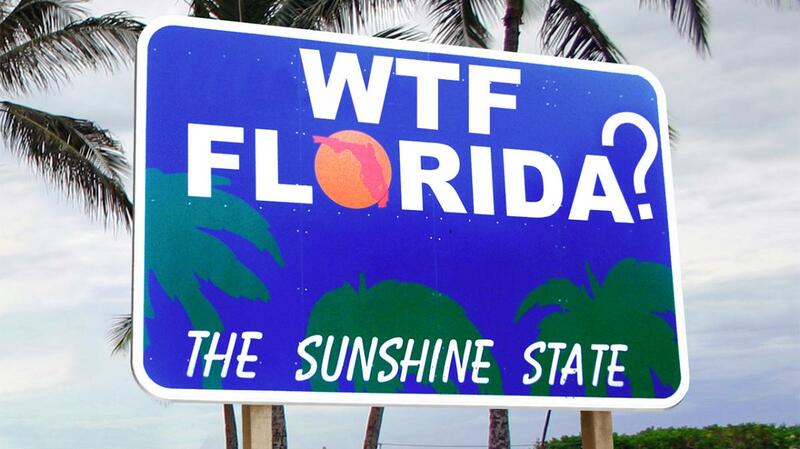 This week I learned of two new crazy legal things that exist in Florida. First you have the case of Donald Trump’s campaign manager Corey Lewandowski. He turned himself in to be arrested on the charge of misdemeanor battery. WTF is that? Now, I have seen the video and as much as I dislike Trump, I see his point. While I am not prepared to really have an opinion on this particular case I do think that anytime battery is an issue, the only word before it should be felony. If Florida wants to make it a crime, as it has, to touch someone the way Lewandowski did to the reporter, they need to come up with a new term because this is ridiculous. And if that didn’t set your ridiculous meter into overdrive, maybe this will. I was in court last week to watch something and happened to see something incredible (not related to my presence). A man was in court on a violation of probation (VOP) issue. I believe the state’s attorney (SA) was looking to send him to jail as this was not his first VOP. Basically, he violated probation then did it again and the state had just about had enough of his shenanigans. The judge asked, “What was his original charge.” (insert Law & Order music here). It was…. felony littering. The man (and a friend) were trying to get rid of (Toxic waste? Human body parts? The “Lucky Charms'” leprechaun’s pot of gold? )… three tires. The judge said, and this may be a direct quote, “If this had come before me, I would not have given you probation so I am not going to send you to jail.” This did not sit well with the SA who protested and just got the same response. The judge believed, and I concur, that if the original crime was not worthy of jail time or even probation, a VOP on this case did not ride to the level to send him to jail. Good for you, Judge Reasonable, good for you. The SA was very upset, said, “Great, I guess probation doesn’t mean anything anymore!” and stormed out of the courtroom. Attention Nuance Police, you have a violation in courtroom 3D. So this week I learned, you can batter someone and get a misdemeanor and throw away some tires and head to jail with a felony. Keep in mind that a felony conviction ends many of your rights such as the the right to vote. Florida needs to seriously get its priorities straight. This entry was posted in Uncategorized on March 31, 2016 by Alyson Chadwick.